In the spirit of Christmas we are extending the special 25% discount on all non-consignment items in the gift shop. This will end on December 22nd, 2012! So come in and pick up some Christmas gifts. We have many items perfect for children and grandchildren. Regular business hours resume Thursday, December 27. Regular business hours resume Wednesday, January 2. 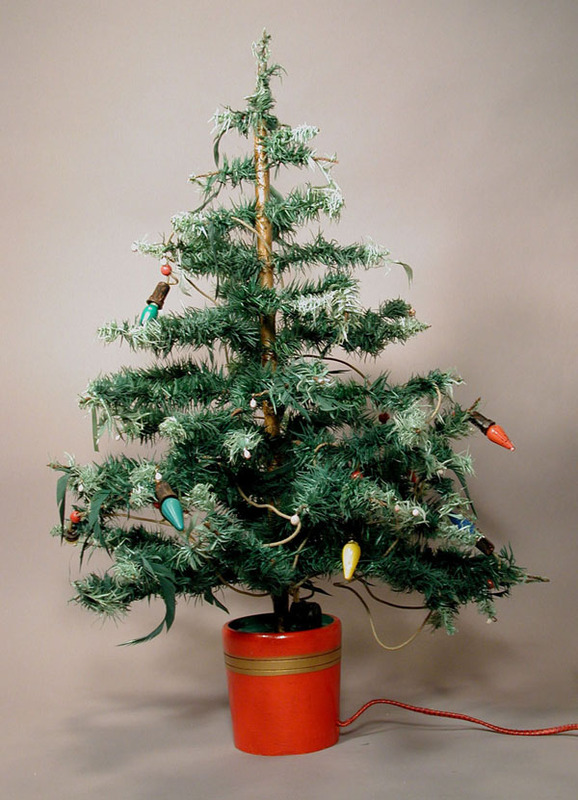 Behold an early form of artificial Christmas tree made from goose feathers – that’s right…green-dyed goose feathers! These trees were popular in North America from about the 1920s to the 1950s. The little number pictured above belonged to Kay Williams who lived in both Cumberland and Royston. No doubt the tree is a later model as descriptions of early forms mention candle attachments and this one comes with its own electric lights. With the additional embellishment and personal touch of ornaments and tinsel this tree would have been quite a festive knock out! Sadly, follow-up research did not reveal a winner. But it would have been a very nice prize to win at holiday time. The Master Bakery in Courtenay was selling decorated 5 lbs Christmas cakes for a whopping $2.25 each and they would special deliver it on Christmas eve. Heureux Noël and Merry Christmas! 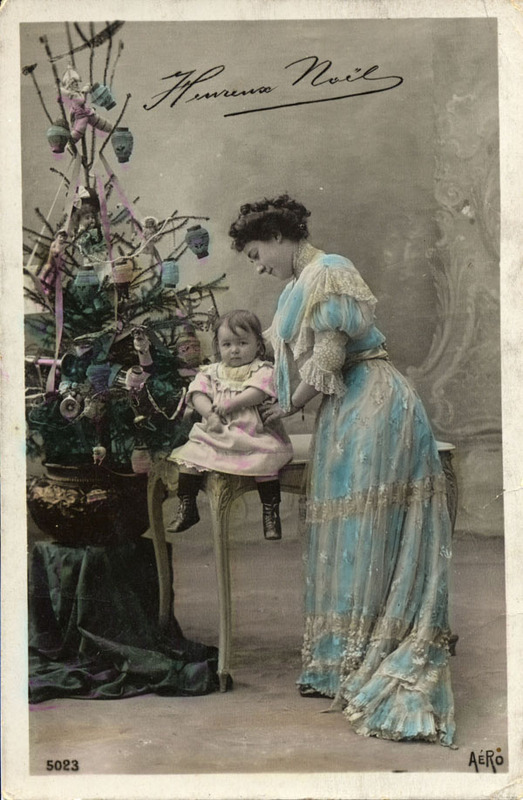 CDM 974.63.13 / c. 1909 French postcard. The board and staff of the Courtenay and District Museum wish you all the very best for the Holiday Season! The wildly popular Wildlife Photographer of the Year exhibition from the Natural History Museum, London and BBC Worldwide returns to the Royal British Columbia Museum in Victoria with 100 winning images from the 2012 global competition in huge, backlit displays. Photographers from Estonia to Taiwan are among the winning entrants, but the overall winner this year – Wildlife Photographer of the Year 2012– is Paul Nicklen from Nanoose Bay, Vancouver Island. His “Bubble-jetting emperors” underwater image of a sunlit mass of Emperor penguins was voted the most striking and memorable of all 48,000 international entries. The exhibition features 100 photographs from 98 countries in 19 categories, including Young Wildlife Photographer of the Year, Gerald Durrell Award for Endangered Wildlife, World in Our Hands and Wildlife Photojournalist of the Year. Each photographic situation is described by the photographer, along with technical details including camera, lens, aperture and exposure. The exhibition isn’t all about creatures either, it includes wild plants and wild places. Photographer Adam Gibbs of New Westminster, BC, was commended for his shot of a miniature Douglas fir growing from a submerged nurse stump in Fairy Lake near Port Renfrew. It appears to be the work of a bonsai master, but is perfectly wild. Paul Nicklen’s expertise shows in “Spirit of the Forest” a Kermode bear enjoying salmon while lounging in mossy coastal forest. The white-coated bear was named in 1905 after Francis Kermode, one of the early curators at the provincial museum, now the Royal BC Museum. Wildlife Photographer of the Year includes both humorous and thought-provoking captures, from the raven on a ‘bad hair day’ to photojournalism portfolios. Impactful images range from storks picking over garbage dumps to the brutal and illegal harvest of rhino horn. There are also carefully crafted images by young photographers from ages 10 to 17, in three age categories. Activities for younger visitors during the run of the exhibition include a Young Photographers Contest in February; a Spring Break Photographic Day Camp – Focus on Nature; and Wonder Sunday: Dancing the Wild Life on March 31. The 2012 Wildlife Photographer of the Year exhibition closes April 1, 2013. Oh, to find that perfect gift! 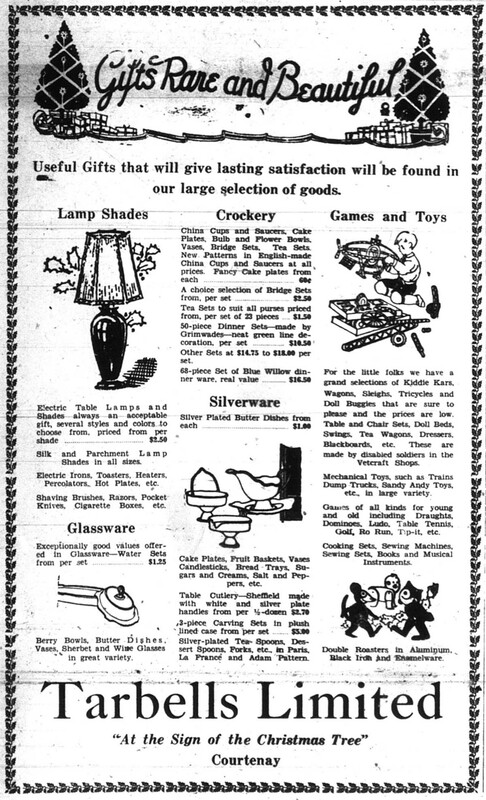 This December 15, 1931 Comox District Free Press ad for the Courtenay Tarbell’s Store has some suggestions – check out how many still hold true 81 years later. The summer of 2013 will mark the 100 year anniversary of St. Joseph’s General Hospital. It was on July 5th 1913 that the Sisters of St. Joseph of Toronto arrived in Comox to establish a hospital on an appeal from the Comox Logging Company. The Sisters opened its doors to patients with a four-bed hospital in a small farmhouse on August 10th of that year. In just a century, the hospital has evolved significantly, growing in size and capability to meet the health care needs of the Comox Valley and surrounding regions. This is a centennial worth celebrating. Since the beginning, St. Joseph’s has proudly served the community with a Christian value-based atmosphere of “Care With Compassion” in the Catholic tradition of the Healing Ministry of the Church. Its legacy is rich and built upon providing excellence in service while giving back to the community. Commemorative celebrations will begin in February with an open house and a special centennial unveiling in the main lobby of St. Joseph’s. In the summer, a “Celebrations in the Gardens” will be held on the hospital grounds. Celebrations will wrap up later in the summer with a formal gala event at the Florence Filberg Centre. 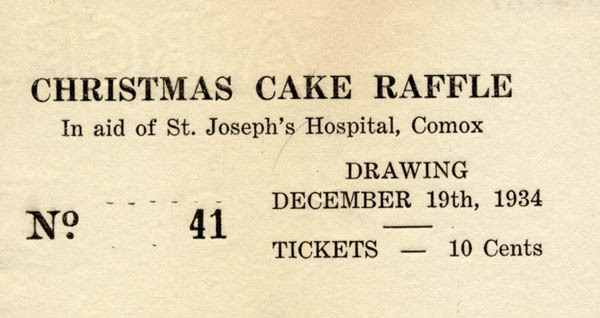 All events are open to the public and are a way of saying thank-you to the community for helping make St. Joseph’s General Hospital what it is today. Watch for dates and times to be announced in the local media. You can follow the Centennial Celebration on Facebook at www.facebook.com/SJGHCentennial. The museum bids a fond farewell to longtime employee Cynthia Lane. Regulars will know Cynthia from her positions as tour programmer, visitor services and home school instructor. She first came to the museum for a work experience placement from G.P. Vanier Senior Secondary School 15 ½ years ago and has worked with the museum in a number of capacities. Cynthia recently mentioned how she originally thought she wanted to go into Law then came to the museum and realized how much she liked palaeontology; then she started working on kids camps and realized how much she liked teaching. “I’ve loved being here, love the staff, love the patrons. And I really appreciate all the help from work experience students and summer students. I especially want to thank Pat [Trask] for introducing me to the world of palaeontology and sharing all of his knowledge”. What does the future hold? Cynthia says we’ll still find her working with kids and hunting ammonites along the rivers of the Comox Valley.